Market liberalization in the Chinese Economy has brought its huge economy forward by leaps and bounds - but rural China still remains poor, even as its cities increase in affluence. China's economy is huge and expanding rapidly. 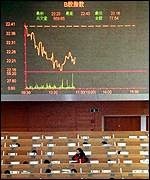 In the last 30 years the rate of Chinese economic growth has been almost miraculous, averaging 8% growth in Gross Domestic Product (GDP) per annum. The economy has grown more than 10 times during that period, with Chinese GDP reaching 3.42 trillion US dollars by 2007. In Purchasing Power Parity GDP, China already has the biggest economy after the United States. Most analysts project China to become the largest economy in the world this century using all measures of GDP. However, there are still inequalities in the income of the Chinese people, and this income disparity has increased in the recent times, in part due to a liberalization of markets within the country. The per capita income of China is only about 2,000 US dollars, which is fairly poor when judged against global standards. In per capita income terms, China stands at a lowly 107th out of 179 countries. The Purchasing Power Parity figure for China is only slightly better at 7,800 US dollars, ranking China 82nd out of 179 countries. Economic reforms started in China in the 70s and 80s. The initial focus of these reforms was on collectivizing the agricultural activities of the country. The leaders of the Chinese economy, at that point in time, were trying to change the center of agriculture from farming to household activities. At later stages the reforms extended to the liberalization of prices, in a gradual manner. The process of fiscal decentralization soon followed. As part of the reforms, more independence was granted to the business enterprises that were owned by the state government. This meant that government officials at the local levels and the managers of various plants had more authority than before. This led to the creation of a number of various types of privately held enterprises within the services sector, as well as the light manufacturing sectors. The banking system was diversified and the Chinese stock markets started to develop and grow as economic reforms in China took hold. The economic reforms made in China in the 70s and 80s had other far reaching effects as well. The sectors outside the control of thestate government of China grew at a rapid pace as a result of these reforms. China also opened its economy to the world for the purposes of trade and direct foreign investment. China has adopted a slow but steady method in implementing their economic reforms. It has also sold the equity of some of the major Chinese state banks to overseas companies and bond markets during the middle phase of the first half of the 21st century. In recent years the role played by China in international trade has also increased. Everywhere you turn these days China is being heralded as the next big thing. There's no question the country is on the rise -- witness the stunning economic growth, massive modernization programs and the rising standard of living in the cities. But the upsides come with downsides. The growing gap between rich and poor, unrest in the countryside, persistant government corruption, and staggering environmental challenges -- all threaten to derail the country's dreams. China's present status as a world economic power comes only after a long and often painful journey. A succession of dynasties ruled China from the second millennium BC to the early 1900s. Chinese history changed course, however, as Europeans expanded into Asia. China suffered through clashes with European powers in the 1800s. Then, in 1911, Chinese revolutionaries overthrew the last dynasty. The country suffered internal strife for nearly four decades due to warlords, civil war and Japanese invasion. In 1949, the Chinese Communist party won the civil war and established China's current government. The Communists implemented many social and political changes, starting in the 1950s with the transition to a planned economy. Leader Mao Zedong launched a "Cultural Revolution," in which young loyalists attacked intellectuals and party leaders. In the late 1970s, the Chinese government introduced economic reforms, introducing elements of a free-market economy. The government also encouraged foreign investment. That laid the groundwork for the modern China we see today. China's economic engine has really been in overdrive for much of the last two decades – the payoff of the 1978 decision by Deng Xiaoping to adopt free-market reforms. But it's only in recent years that the public at large has taken notice. The China story has simply become so big that it's impossible to escape. Its GDP is growing by 10 per cent a year. Industrial production is galloping ahead at an annual rate of 17 per cent. Its economy is now the second-biggest in the world, behind only the U.S., and there are predictions it will assume the top spot as early as 2020. China's integration into the world economy has been astonishingly rapid. Since its adoption of the "Four Modernizations" a generation ago (agriculture, industry, science and technology, and defence) China's share of world economic output has grown from 3.4 per cent to almost 12 per cent in 2000. Its admission into the World Trade Organization in late 2001 has only served to accelerate that growth. The World Bank now estimates that exports represent a quarter of China's GDP, five times the level of 1978. And it's not just exports that are booming. China is consuming and importing at a frantic rate. Global trade was moribund in 2003, but China managed to boost its imports by 40 per cent that year. It is now the world's biggest consumer of copper and aluminum as its appetite for imports of raw materials shows no sign of easing any time soon. China's economic transformation has helped to create a large middle class. Wages have risen, but still remain well below those in the rest of the industrialized world – a fact that has kept Chinese goods competitively priced and allowed China to make major inroads into markets where they were formerly bit players. China's explosive growth has come at a price. The economic gains have not been shared equally. Millions have become richer. But hundreds of millions have not. More than 60 per cent of the population still toils in agriculture; the country's "economic miracle" has yet to make an appearance in much of the country. Corruption also remains well entrenched. The so-called "Iron Rice Bowl" has become one of the casualties of China's transition to a market economy. Where central planning once guaranteed lifetime employment for everyone in the work unit, the old guarantees are now gone. Millions of workers have lost their jobs in the restructuring, prompting frequent protests. The concept of sustainable development has proven to be a fleeting goal in China. Environmental concerns take a distant back seat to growth. Air pollution is among the worst in the world. The World Bank estimates that 16 of the world's 20 most-polluted cities are in China – fallout from the country's heavy use of coal-fired generating stations. Anyone who's been to Beijing can attest to the perpetual haze that hangs over the city – a problem its leaders know they must address before the city hosts the Summer Olympics in 2008. The steady growth of its military remains a worry in the region and globally, as does its growing insistence on blocking Taiwan's independence aspirations. Human rights exist on paper only; dissidents continue to languish in jail. China leads the world in executions. The 1989 crackdown in Beijing's Tiananmen Square may have attracted world condemnation. But China's Communist leadership offered no apologies. Since then, there has been no substantial liberalization in China's political structure. Despite the odd release of a dissident or two, official tolerance for differing views remains low. Its one-child policy has led to accusations of forced abortions and a distinct shortage of girl babies. Things aren't all bleak, to be sure. China's fashion, arts and cultural community has enjoyed somewhat of a renaissance of late. You no longer see the Mao suits that once dominated urban streetscapes. Chinese artists, with some exceptions, are enjoying unprecedented freedoms. Chinese authorities, again with some exceptions, are even allowing their citizens to access the internet. Still, the challenges facing the modern China remain daunting. How do you keep 1.3 billion people happy while engineering an economic and social revolution? But it seems determined to press ahead with its "great revival." The world is already watching.